A 3,700 years old new pyramid has just been discovered some 40 kilometers south of Cairo, and it looks different from the ones you know. A team of Egyptian archaeologists found a new pyramid dating back to the 13th Dynasty that had been hidden until now, the Egyptian Ministry of Antiquities announced earlier this week. 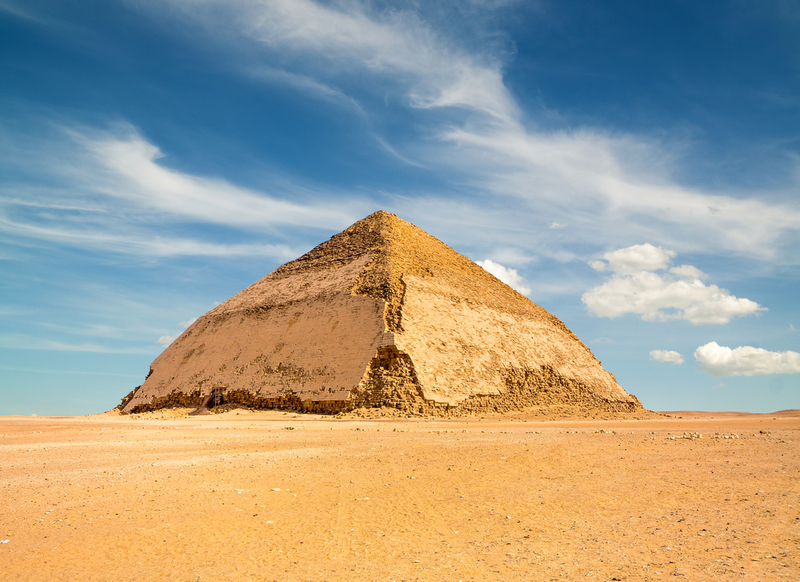 Located just north of King Sneferu’s pyramid, which is famous for its different shape, the oddly-shaped pyramid is believed to be nearly 4,000 years old. However, the team are currently trying to determine the size of the pyramid which lies earthed. So far, the team has uncovered the pyramid’s inner structures, including a corridor that leads to a lobby, which rises from ground level up to a ramp on one side. The interior walls and columns are reported to have lines of hieroglyphs engraved all over them. Because of the bent slopes of the interior, the archaeologists believe that the pyramid could be an earlier model of the attempts to build a smooth-sided pyramid, somewhat like King Sneferu’s. King Sneferu was a Fourth Dynasty pharaoh over Egypt. All pyramids dating back to his era included funerary facilities, and are located in Dahshur necropolis, a burial site for high-ranking officials and courtiers. On their Facebook page, the Ministry of Antiquities said that the pyramid was in good condition, and that further excavation will reveal more about the ancient structure. Earlier in March, Ministry of Antiquities announced that they had unearthed a statue that depicts Pharaoh Ramses II outside of Cairo. However, they now believe that it might in fact depict Psamtik I, the first king of Egypt’s 26th Dynasty. Also in March, archaeologists working around the area of the King Amenhotep III Funerary Temple found what is believed to a unique statue of Queen Tiye, King Tutankhamun’s grandmother.